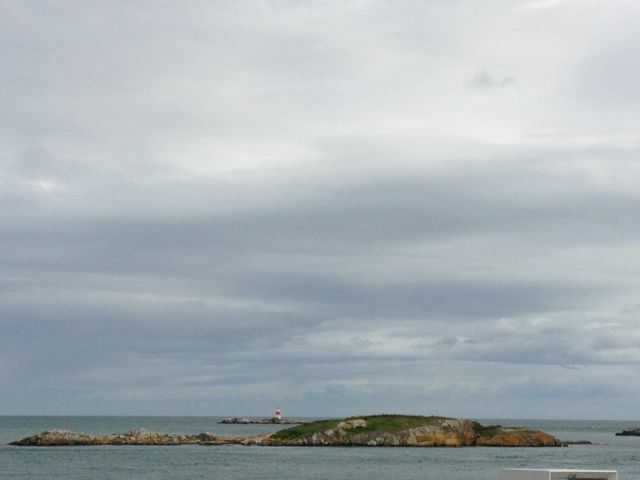 Here are some pics from our morning walk in Dun Laoghaire, back in Dublin. (You pronounce it Dun Leary, in case you’re ever in town and want to sound like a local.) Really though, no one could really blame the non-Irish for mis-pronouncing Irish words and names – things here are rarely as they seem, so I generally ask before I try to pronounce. For example, test yourself on these Irish girls’ names: Caoimhe, Cliona, Ailbhe (yes, that’s right: Quee-va, Clee-na, Al-va); and then there are these Irish boys’ names: Daithi and Feidhlim (yep, Dah-hee and Fail-im). There’s also a boy’s name that sort of sounds like you’re clearing your throat – Cathal (sort of Co-hol). Sometimes I used to think that my Irish friends were making the names up just so they could giggle as I tried my best to sound authentic. 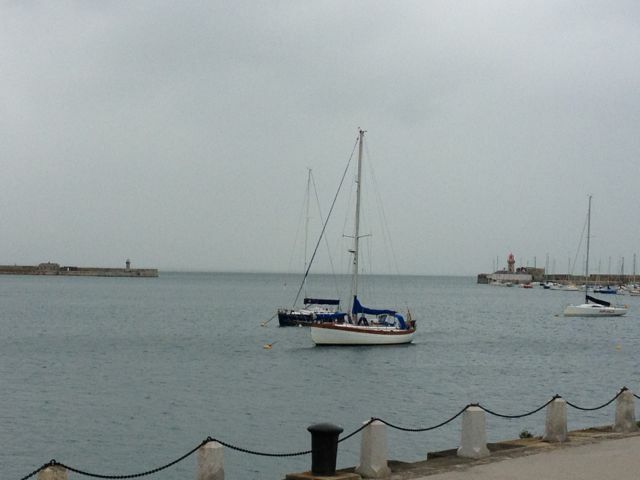 An overcast day at Dun Laoghaire. 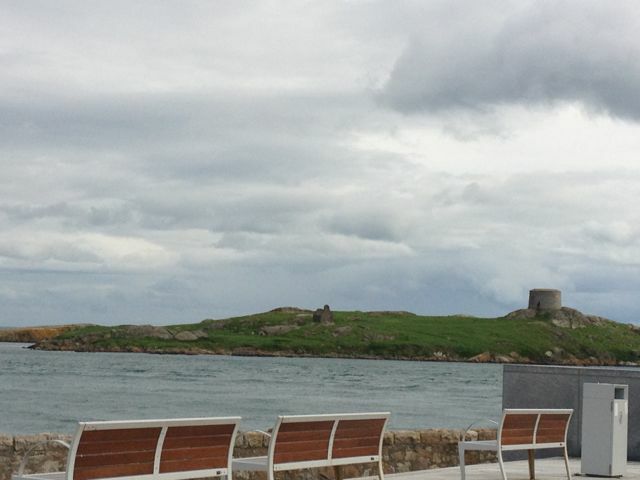 Sure, just more ancient ruins on an emerald island. 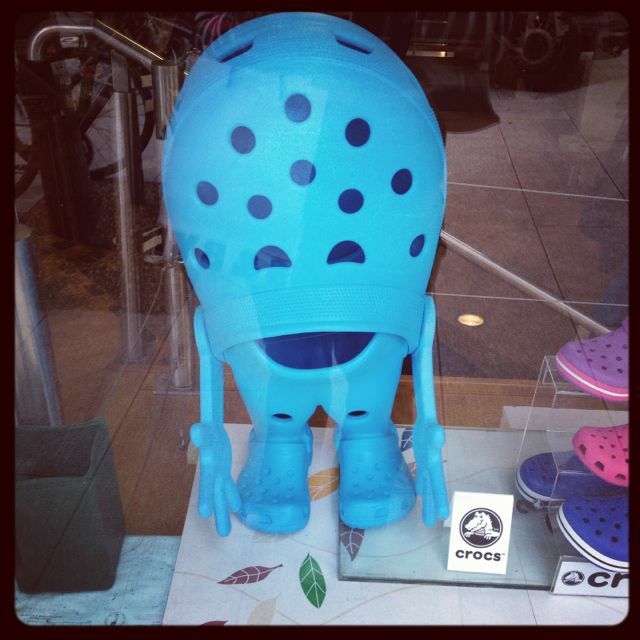 And although he isn’t part of the natural beauty around Dun Laoghaire, I couldn’t resist this pic of Crocs Man, in the window of one of the shops there. Unfortunately, he’s not for sale. Although he probably wouldn’t fit in my suitcase anyway, so I think it’s for the best.